I just have to first say that I am writing this from Florida while sitting outside! Unfortunately, it’s not sunny yet, but the sun is trying to peek through the dark rain clouds and I really hope it does. You see, I really hate the rain. I hate rain more than any other type of weather, it just depresses me. I think I need to accept it though because apparently it is rainy season here in florida. Oh well, if there is one good thing that comes from rain it is shopping. Lots and lots of shopping, which my grandma is a pro at. Like a top of the line pro, so I know we are going to have fun rain or shine. Anyway, I’ll try to keep you updated on the happenings of my trip as they happen, but for now, let’s just talk about these cute little triangular Samosas. 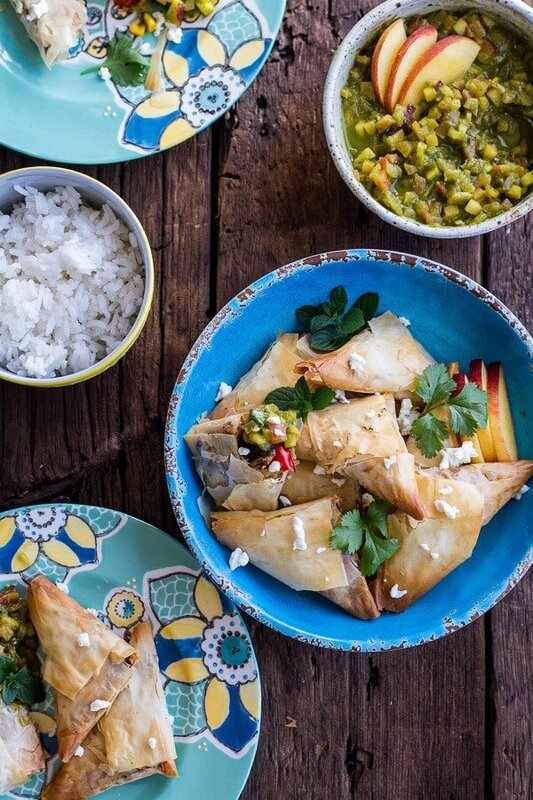 These are not your typical Indian Samosas. Instead of the traditional Indian potato filling, I swapped in a whole bunch of summer veggies. And some goat cheese, because I thought, why the heck not, I mean goat cheese goes with these flavors. And let’s be honest, a little goat cheese can never, ever hurt. You know my take on cheese. 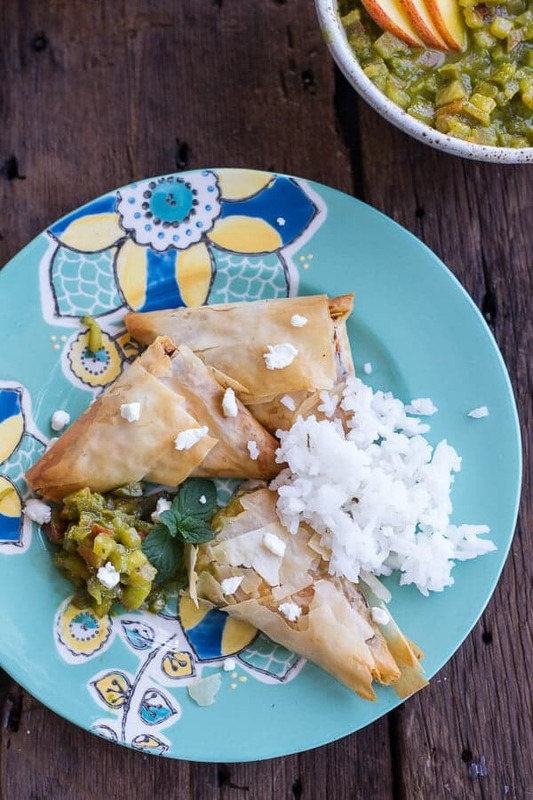 Cheese, especially goat cheese, is only going to make samosas better!. So the filling is basically just a whole bunch of veggies mixed with indian spices and a little curry powder. I just thought they sounded really good together. Samosas are all about the pastry around the filling. A lot of people make a homemade pastry for their samosas that I am sure is absolutely amazing. But unfortunately, I did not do enough research on these and never read about the homemade pastry dough until AFTER I had already made them. It’s ok though because I used phyllo dough, which you really can’t go wrong with. Plus it makes this meal easier to handle for a faster summertime version. For the chutney, I kept it really simple. Instead of an all mint or cilantro chutney I added a ton of basil and a sweet peach. I know it may sound a little odd, but I promise it’s so good and perfect for eating with these samosas. Also, it’s just that time of year when I start adding basil and peach to almost everything I make. Gotta eat um up while you can! Preheat the oven to 350 degrees F and grease two baking sheets. Heat 1 tablespoon coconut oil in a large skillet over medium heat. Add the onion to skillet, and cook for 2 minutes, stirring occasionally. Add carrots, corn and red pepper, cook 2 minutes, stirring occasionally. Add the zucchini, garam masala, curry powder, mustard powder, pinch of cayenne, pepper and salt. Cover and cook 4-5 minutes or until the veggies are tender crisp. Remove from the heat and stir in the sun-dried tomatoes. Allow to cool 10 minutes and then stir in the goat cheese crumbles. 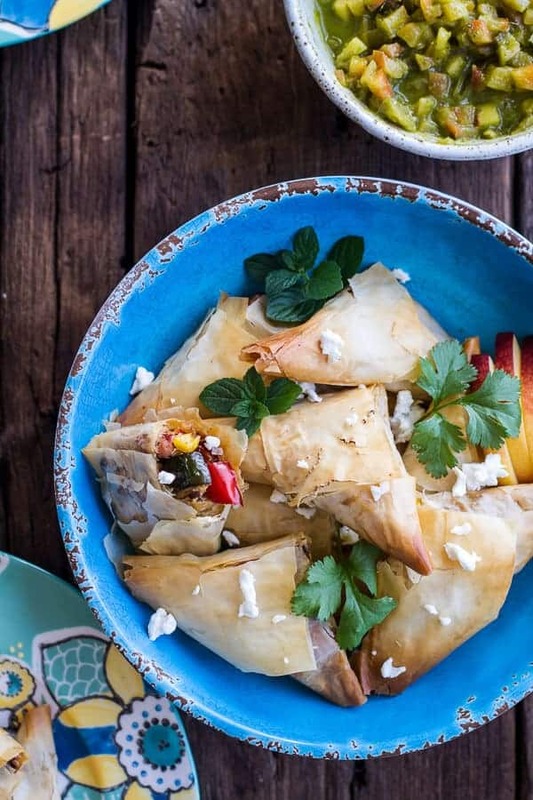 Grab two sheets phyllo dough and lay one sheet on top of the other so they look like one single sheet. Cut the sheet lengthwise into 3 even strips, and coat each strip very lightly with olive oil or coconut oil. Cover the remaining phyllo dough to keep from drying while you work. Spoon 1 tablespoon of the veggie mixture onto 1 end of each strip. Fold 1 corner of phyllo dough over mixture, forming a triangle; keep folding back and forth into a triangle until you reach the end of the strip. Place triangles, seam side down, on a baking sheet. Brush triangles with the remaining 1 tablespoon melted coconut oil. Meanwhile make the chutney. Add the butter to a high sided skillet or sauce pan set over medium heat. Add the peaches and saute until soft, about 5 minutes. Once the peaches are soft, add the garlic, ginger, honey, bourbon and apple cider vinegar. Bring the mixture to a simmer and simmer 5 minutes or until the the liquid has thickened and reduced. Remove from the heat and stir in the basil, cilantro, lime juice, jalapeño and a pinch of salt. Store in the fridge until ready to serve. *You can puree the chutney if desired, but I am not sure of the color. I pureed the herbs and wished I would have just left them chunky. My color was not so pretty. 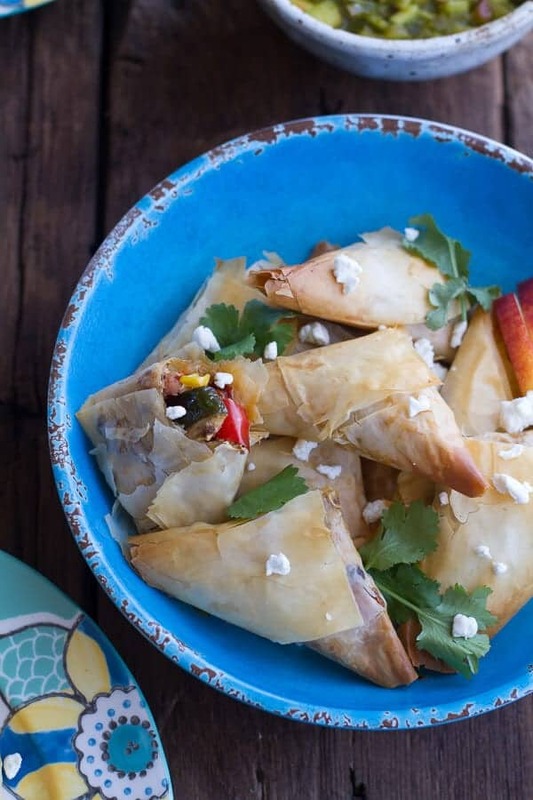 Oh and come on, doesn’t that buttery, crispy phyllo dough look amazing?? Yum! 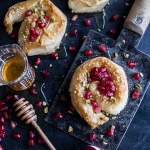 Goat Cheese Stuffed Phyllo Swirls with Pomegranate Honey + Pistachios. These look delicious! I love more goat cheese on anything really 🙂 I hope it gets sunny soon! I love visiting you. Always a flavor explosion! Can’t wait to try these out! These look so yummy…the peaches have been coming fast and furious and I can’t get enough of them so good…Have fun in Florida with your grandma…shopping cures all. 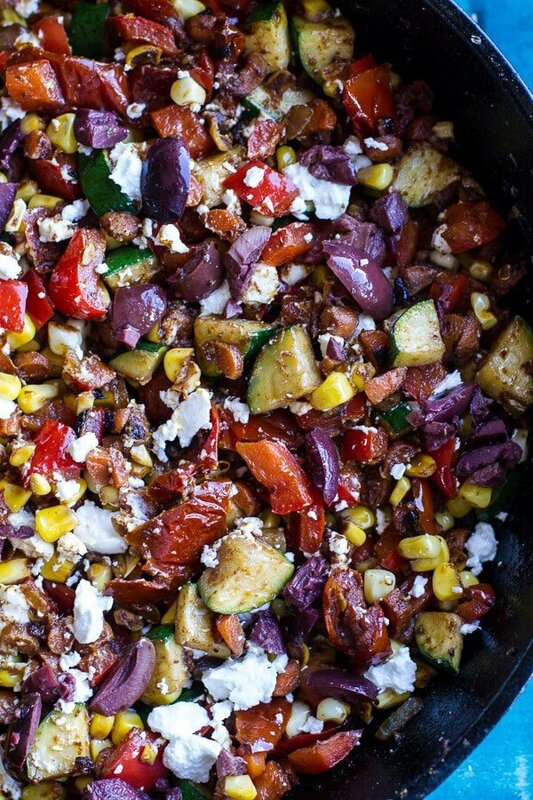 Do you have kalamata olives in the veggies? In the picture it looks like it. yes, I do. Sorry about that, i will fix the recipe! 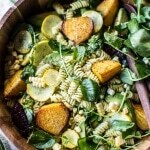 Girl I want to jump in and hug you for this recipe! 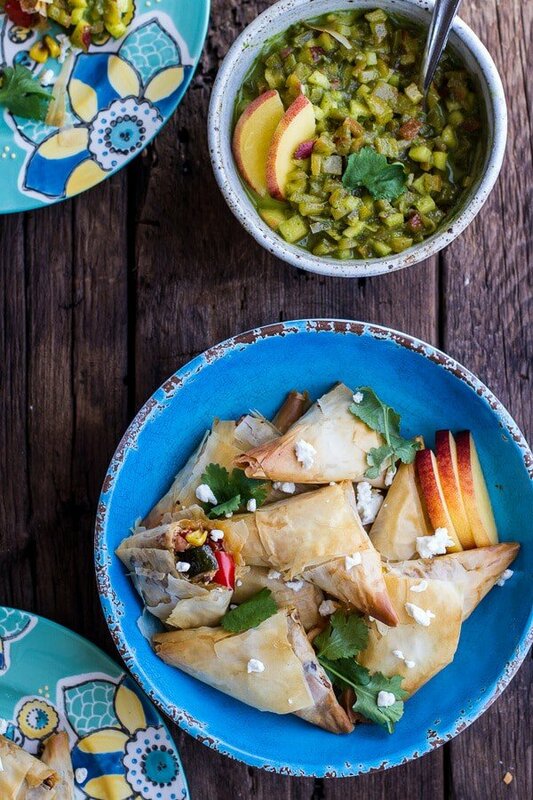 Samosa are very popular in the middle east and are eaten during Ramadan EVERYDAY for an entire month. 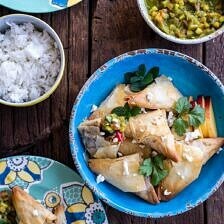 I’m going to be making samosas everyday next month and I’m sure the family is going to love this version! I love that you used phyllo pastry instead. Although I’ve made samosas a billion times, I’ve never thought about using it. YUM! OMG the chutney is amazing just by itself, YUMMMMM! Wow, these look fantastic! 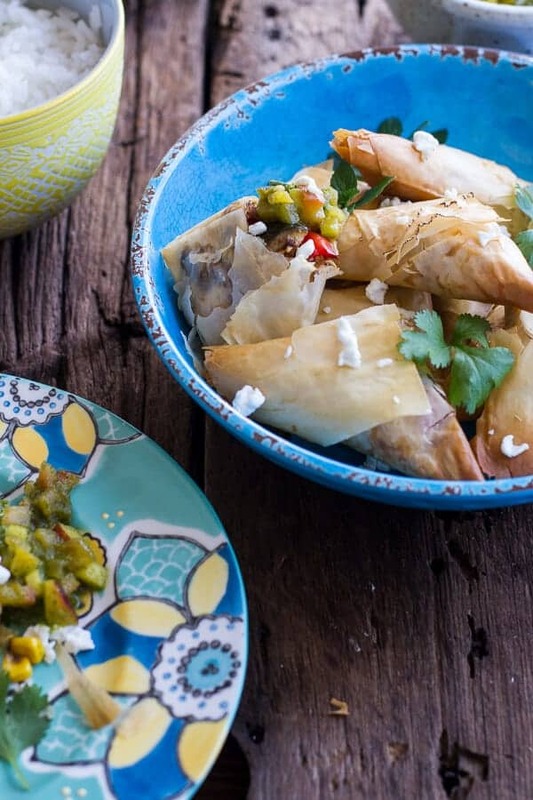 With the phyllo dough and cheese, they remind me a bit of a cross between samosas and spanakopita – YUM! This recipe looks delicious and I’m loving the props! 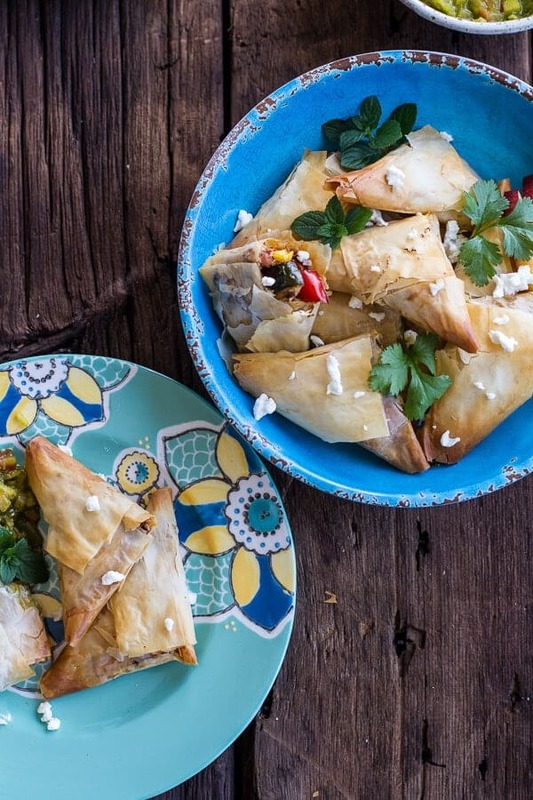 That veggie, goat cheese filling looks amazing! I would eat that with a spoon all by itself! I love this! 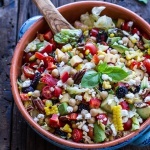 A perfect way to serve summer vegetables! I am drooling for this!! The flavors!! This is going on my must-try-soon list! These look incredible, love the chutney! Hope the sun comes out for you soon! I agree: goat cheese makes everything better! I love this spin on one of my favorite Indian treats! Yum! I love roasting any veggies so this looks perfect! 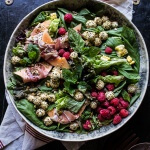 love the flavor combination you created here!